I have written many times about the large number of reasons why increasing the gas tax at the federal and state level is very important for achieving a number of important societal and transportation goals. However, I am very, very wary of increasing transportation revenues for county government (and state and federal government) these days (in this case, via a gas tax), as I believe that strong majorities favor ruinous policies that are intended to make cars happy (largely by increasing road capacities). While most all American communities at least pay a lot of lip service to wanting to provide improvements for transit, bicyclists and pedestrians, the track record (even when there are “progressive elected majorities”) has been that when push comes to shove, everything takes a back seat to the imperative of making cars happier. As a result — sadly and regretfully — I am unable to trust local elected officials enough to give them more transportation cash. Nearly all of their voters (including most environmentalists) will demand that the extra cash be used to increase road capacities for cars (environmentalists will wrongly claim that doing so will reduce air emissions). The only way to inhibit this downwardly spiraling path is to starve communities of transportation cash so that elected officials are forced to restrict themselves from voting to ruin the community (by building bigger roads). As was once said, it is only when you are short on money that you are forced to think and behave smartly. Because we’ve had so much money in the past, we’ve done a lot of things unthinkingly and ruinously. It is time to smarten up. Note that I’d be somewhat more comfortable if the gas tax revenues could be DEDICATED to non-car transportation improvements. However, I believe that doing so is a violation of state or federal law. America is unique in the sense that we are the only nation on earth that prohibits gas tax revenue from going to pay for anything besides transportation for happy cars. Sprawl erodes a sense of community and breeds loneliness. I often make that point in my books, and in my speeches. Cars play a powerful role in isolating us and extinguishing the crucially important experience of serendipity. Because humans are a social animal, I believe the isolation and lack of friends creates a deep sadness and emptiness in people. Bowling Alone, by Robert Putnam, is a fantastic book describing this sad state of affairs. Our species does not do well at all when we become loners, and the younger generation in particular are loners. We are becoming a NATION of loners. It does not bode well for our future, as loneliness breeds dysfunctional behavior. Sprawl, of course, plays an important role in breeding loneliness. I often tell people that one of the top things I have always concerned myself with professionally is how to design communities or neighborhoods so that there is an increase in conviviality (a vanishing pleasure, and yet a pleasure that is so important to a fulfilling life). 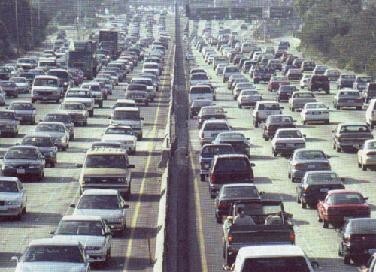 The auto-dependent American lifestyle is deadly to conviviality. We become suspicious of each other. Trust spirals downward (which breeds political conservativism, by the way). We lock our doors and further cocoon ourselves in a self-perpetuating loop. 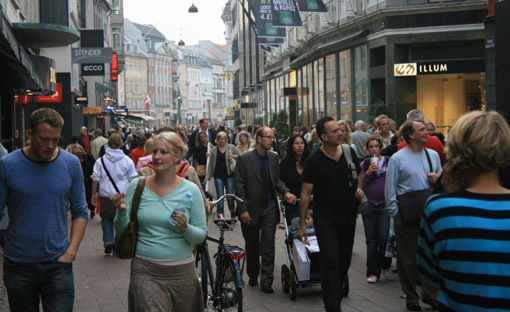 I envy those who live in Western Europe, as a great many of their cities are vibrant with pedestrians, sense of community, and therefore conviviality. Such a life is infinitely more fulfilling and satisfying than that of a loner. In the early part of 2006, I started talking with a friend about maybe starting what is known as a “conversation cafe.” A way to regularly meet with friends (and STRANGERS) to discuss anything at all in a non-threatening setting. We ended up hosting such an event for a number of months in Gainesville, Florida. Such a planned socialization and conversation (in contrast to a more rewarding lifestyle and community, where such activity is more regular and more spontaneous) is necessary in a nation of loners. And not surprisingly, such planned events rarely happen.